Homemade caramels from the Tradewind Confections kitchen. Caramel anything is good, in my opinion. Homemade caramel anything is spectacular, and homemade caramels make a fabulous fall or winter wedding favor. Never made candies before? Don't worry--this is a pretty darn easy recipe to follow, great for a first-timer. 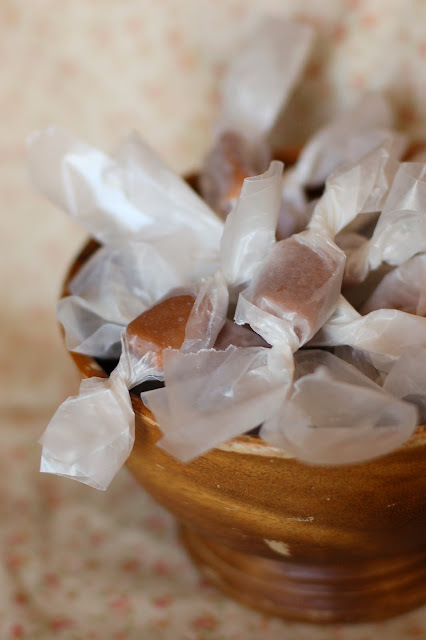 One batch makes approximately 100 perfect bite-sized caramels. I say approximately because I didn't count the irresistible caramels that my daughter and I sampled. Quality control is, you know, important and stuff. Yeah. sea salt to taste, for sprinkling on top of the caramels. In a small saucepan, bring butter, cream, and the teaspoon of salt to a boil. Remove from heat and set aside. Boil sugar, water, and corn syrup in a second, good sized (4 quart-ish) pot. Stir frequently until the sugar is dissolved. Once the sugar is dissolved, stop stirring! Gently swirl the pan until the ingredients turn a light golden caramel color. Watch carefully--this happens quickly! Carefully stir the cream mixture into the sugar mixture. It will bubble up impressively, but don't worry! That's why we used a biggish pot. Keep stirring until the mixture reaches 245 on a candy thermometer. Remove from heat, and quickly stir in the vanilla and vinegar (or lemon juice). That's a silicone pan. I don't use them for much, but for bar cookies and caramels, they're absolutely brilliant! If you don't use a silicone pan, you'll need to line your pan with parchment paper, butter or oil the parchment paper and pan, and then cross your fingers and hope hope hope the caramels come out of the pan. If you use a silicone pan, no stress, no worries, it just works. No parchment or oiling or pan prep of any kind necessary. 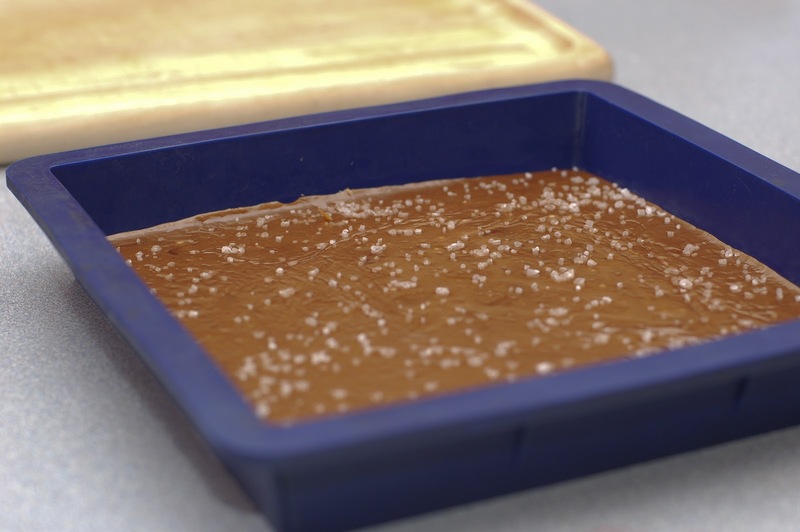 Let the caramels cool for about five minutes. Sprinkle with sea salt, if desired. It's not necessary, but I love that burst of salt with the silky-sweet caramel. Yum! If you sprinkle the salt too early, it will dissolve into the surface. Too late, and it won't stick. 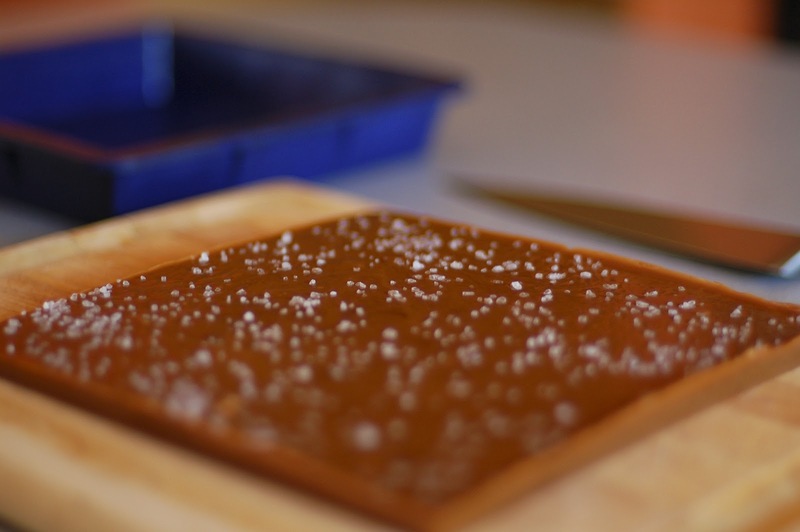 Let the caramels cool for at least two hours, then turn them out on a cutting board. Look how gorgeously it pops out of the silicone pan! So easy when you have the right tools! Cut into pieces. You can use a knife, or kitchen scissors. Both work, but I usually grab the scissors, myself. One word of advice--don't turn out the caramels and then leave them sitting on the cutting board for an hour or so. It will meld to the board and stick with a force heretofore unknown outside of the superglue testing labs. Wrap the pieces in squares of waxed paper. You can also buy commercial candy wrappers, but I've had sticking issues with those, and I love the classic, old-fashioned, homemade look of the waxed paper. There you go! I'm a big fan of edible favors anyway, but I would be so delighted to get this as a favor at any wedding I attend! It's inexpensive, delicious, and so special to give something homemade. Plus, you can make these several weeks ahead of time, unlike cookies! Fair warning, though--it might be hard to keep from eating them all in those weeks before the wedding. They're that good. Fairy Party: Part 4, the Grand Celebration! Fairy Party: Part 3, the Dessert Table!